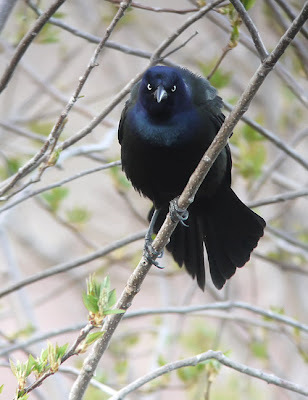 The Boreal Songbird Initiative, along with other environmental groups like Bird Studies Canada, Nature Canada, the David Suzuki Foundation, among others created a petition called “Save our Boreal Birds” a little over a year ago. 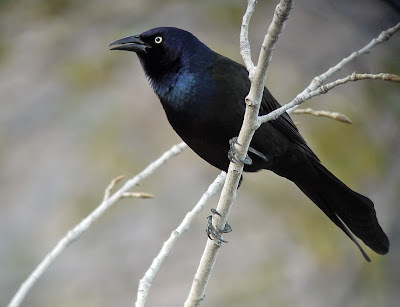 This petition will be sent to the Prime Minister of Canada and many provincial leaders, and asks that vital bird habitat be kept intact despite the fact that over 30% of the Boreal Forest has already been designated for development. As you may know, many migratory birds that travel through the US and other countries breed in the Boreal Forest to the north. We’re launching the petition on May 12th, and are currently at about 60,000 signatures. We’re trying to get up to 70,000 before the launch. Take a moment to sign the online petition, won't you? A strong spring storm blasted through Colorado last Friday and Saturday, bringing lots of much-need moisture in the form of rain and snow. 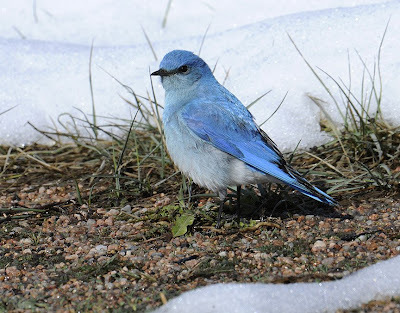 In some areas the snow piled up by the foot, especially in the elevations where Mountain and Western Bluebirds were already on territories. 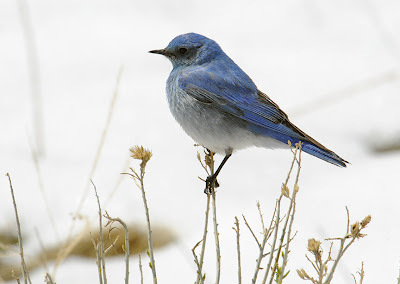 In April storms like this, the early-arriving bluebirds retreat back down to the plains to ride out the weather. 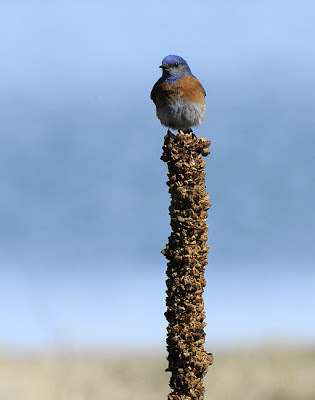 Birders visiting Chatfield Reservoir SW of Denver on Saturday reported seeing thousands of bluebirds, so when the weather cleared out on Sunday I went down to check it out. 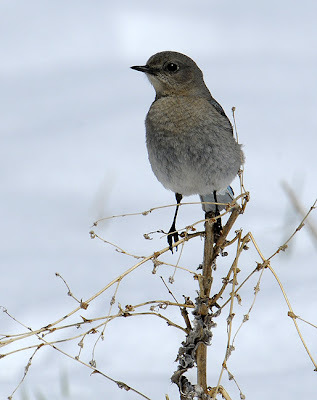 Sadly, the storm had been too much for some bluebirds, and I found some where they had perished looking for shelter in the lee of buildings or at the base of vegetation. But there were lots of bluebirds still around, and I'd estimate I saw at least 1000 throughout the park on Sunday. 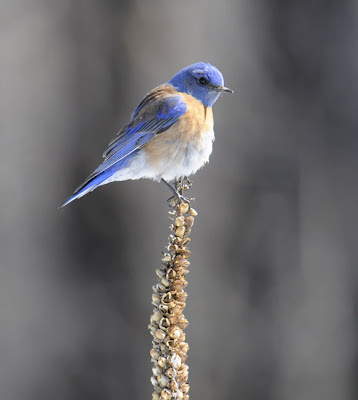 Most were Mountain Bluebirds but perhaps 1 in 3 were Westerns. 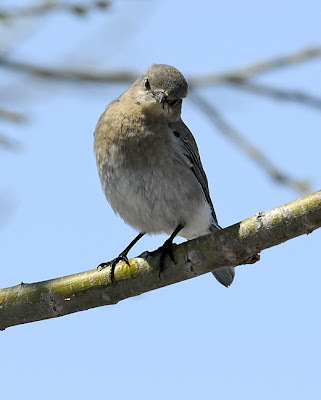 Eventually, I found an Eastern Bluebird, too. 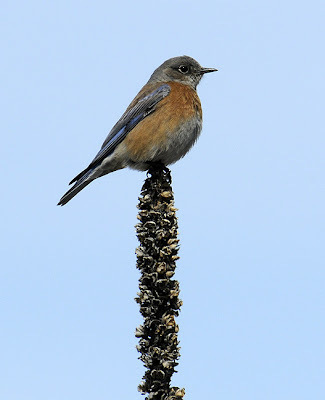 At that point all three bluebird species were visible from the same place- the first time I've ever been able to claim that! In contrast to the soggy, miserable birds that I saw in the rain and snow the day before, these birds were dry, fluffy, and gorging on worms creeping along the soggy ground and torpid insects melting out of the snow. So like lots of things in the natural world, the storm wasn't really all good or bad- while it cut down some birds it provided a feeding opportunity for survivors. 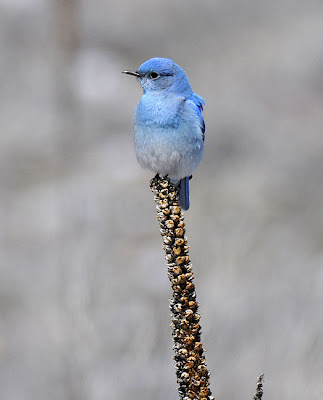 By the afternoon the snow was fast receding and so were the bluebirds- many were heard or seen flying north and west to head back up towards their breeding grounds. Another storm (probably mostly rain this time) is predicted for the weekend so we'll see what drops out in that one! As migration gets into full swing, many birders deal with "warbler neck" from craning up towards the canopy while slinging bins. Along comes an interesting product to support your neck- the Sky View Pillow! Looks like a great idea- check it out! Whether you are searching the treetops and mountains for birds, viewing airplane acrobatics at an air show or identifying constellations and planets on starry nights, "warbler neck", plane pain, and constellation cramping can be behind you...in the past...instead of behind your head. Welcome to the world of the Sky View Pillow (Patent pending) where providing cushioned, heads-up experiences is our goal. 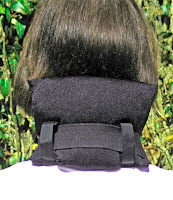 Made from high quality Lycra (stretchable material), this pillow will help alleviate pain in the neck. The pillow, double hemmed for added durability, is generously stuffed with a hypo-allergenic polyester fiberfill. Two Velcro straps provide a convenient, easy attachment. A lot of the discussion on the Digiscoping Birds list for the past couple of months has been about a new camera, the Panasonic Lumix G1 DSLR. 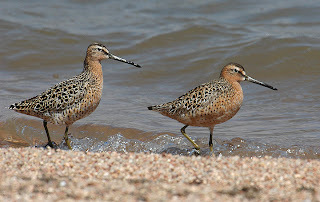 Neil Fifer broke the ice, finding that the camera's included kit lens works well for digiscoping, and he has continued to refine the use of the camera for digiscoping purposes along with several other active members of the list. 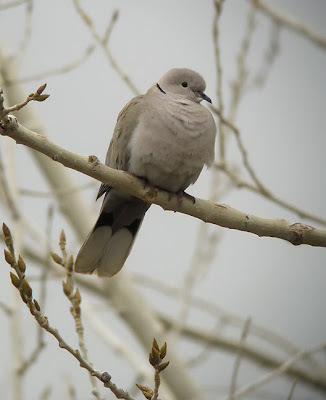 For me, the most attractive digiscoping features are a mirror-free design, filter threads on the lens for attachment, a humungous swiveling LCD monitor, fast internal lens autofocussing, and reasonably small size. I tried mounting it to my Leica APO-Televid 77mm scope with both my 20X and 32X wide-angle eyepieces using a Swarovski DCA adapter (Ben Lizdas of Eagle Optics had generously made me a shim to make up the eyepiece diameter difference of the Leica eyepieces vs. the slightly larger Swaro's.) Everything went together well and was super easy but even at the idealized zoom setting I was getting some vignetting. So I tried the camera without the adapter- lo and behold, the rubber eyepiece cup snugged about perfectly into the recess at the front of the G1 lens! So the camera was centered, secure, lens close but no glass on glass, and vignetting was gone with a little zoom applied to the lens. More zoom brought back vignetted tunnel-vision, which was a bit dissapointing, but I think this will be a very easy, usable combination to use in the field. I found that I could look through the viewfinder of the camera, left hand wrapping the camera lens/eyepiece in a monkey grip to keep them together and move the scope, while my right hand worked the shutter. 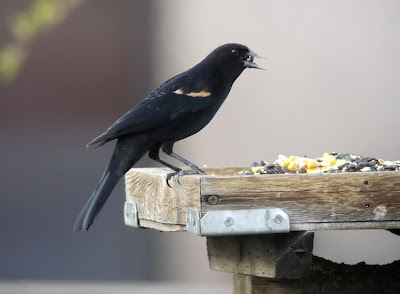 In some ways, it brings back the "good old days" of the Nikon Coolpix 990/995/4500 series, cameras that could easily be handheld to scope eyepieces for good results or mounted using filter threads for more serious applications. What I don't miss about those Coolpix models (I used the 995 and 4500) is their agonizingly slow focus searching, shutter lag, tiny dim LCDs, and noisy images. Now, with the G1, all of the power, speed, and functions of a prosumer DSLR (like 12 MP images, low-noise sensor, fast autofocus, and about non-existant shutter lag) can be easily harnessed for digiscoping. 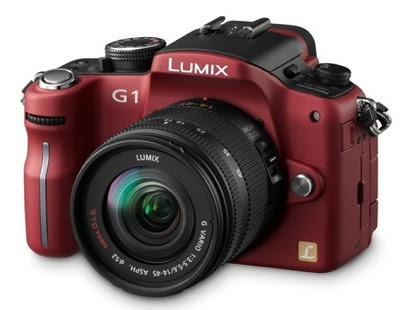 This summer, look for the G1H which will also have HD video capability! 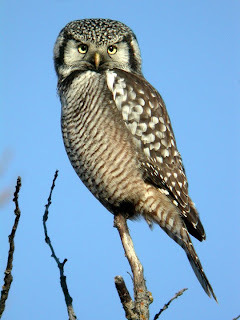 Do we have a new heir-apparent for top digiscoping camera? Perhaps so. Of course, since the package arrived a couple of days ago I've been mostly at work and for much of my remaining daylight free time it has been raining and/or snowing. Yesterday, a storm hit and it rained all afternoon (and is snowing now), but the evening before I had about 40 minutes before sunset to mess around with it. Clouds prevailed sight wasn't great and the birds weren't super cool, but here are a few samples of hand-held images taken at high ISOs (400 and 800). Not bad for right out of the box, hand-held to the eyepiece! I'll post more when I figure out more about this combo- hopefully I'll have sunny weather, time, and fun birds to play with soon.